Subscribe to best publication in the filed of computer. 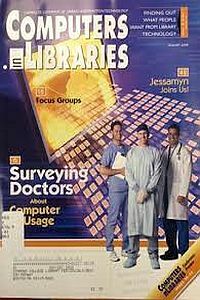 Case studies, best practices, profiles, and studies all written “by librarians, for librarians” . . . articles that help you tackle the unique challenge of technology adoption, adaptation and service innovation in real libraries. • In-depth, objective articles and white papers that help you buy the right products and services for your library. Plus, an annual buyers’ guide edition, updated continuously online at http://bg.computersinlibraries.com. Be a part of the Computers in Libraries community by joining us at our Computers in Libraries, Internet Librarian or Internet Librarian International conferences. Consult CIL magazine for advance show guides and program previews. Subscriptions start with the next available issue (monthly, except Jan/Feb and Jul/Aug).